Scarborough RUFC's comprehensive 33-0 home win against North Ribblesdale saw Simon Smith's side move into second in the Yorkshire One table. 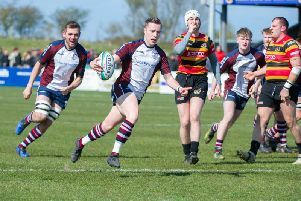 James Perrett scored the first try of the game, with further efforts from Sam Dawson and Aaron Wilson steering the Silver Royd side into a 21-0 half-time lead. After the interval Ben Martin raced over to make it 26-0, and then Perrett's second try completed the 33-0 win for the home side. DON'T MISS: Two pages of coverage from Scarborough RUFC, including coach Simon Smith's column and much more, in Thursday's Scarborough News.